OUR PASTOR | REMNANT MINISTRIES THE "CUPBEARER"
Pastor Randall was born in Santa Barbara, California. He has three older brothers; Anthony, Bruce, and Sam “Bam” Cunningham who played for 10 years in the NFL with the New England Patriots. After becoming an All-American football player at UNLV, Randall played 16 seasons in the NFL, starting with the Philadelphia Eagles. He would later play for the Minnesota Vikings, the Baltimore Ravens, and the Dallas Cowboys. In May of 1993 Pastor Randall married his lovely wife Felicity De Jager of Johannesburg South Africa. They are the proud parents of five children. After spending a year-and-a-half away from professional football, traveling, evangelizing, and sharing his testimony, Randall would return to the NFL to play quarterback for the Minnesota Vikings. It was during his time with the Vikings that he met then Team Chaplain, Reverend Keith Johnson. 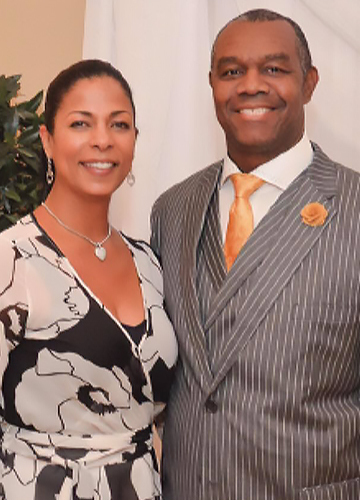 Keith, who is the founder of C.A.U.S.E (Christian Athletes United for Spiritual Empowerment), impacted Randall and Felicity so significantly that they made the decision to join his ministry and become members of its Board of Directors. In 1998 Randall achieved Most Valuable Player honors in the NFL; his 3rd time doing so in 13 years, and it was during the 1998 off-season that he began an intimate bible study in his Las Vegas home. Six years later this impromptu bible study would become what is now Remnant Ministries; A Multi-Cultural Christian Fellowship. Come join us and experience the love of God through our ministry. We are a non-denominational, multicultural fellowship that believes Jesus receives all who repent and believe in Him. Hey Buddy!, I found this information for you: "OUR PASTOR". Here is the website link: https://remnantministries.net/our-pastor/. Thank you.